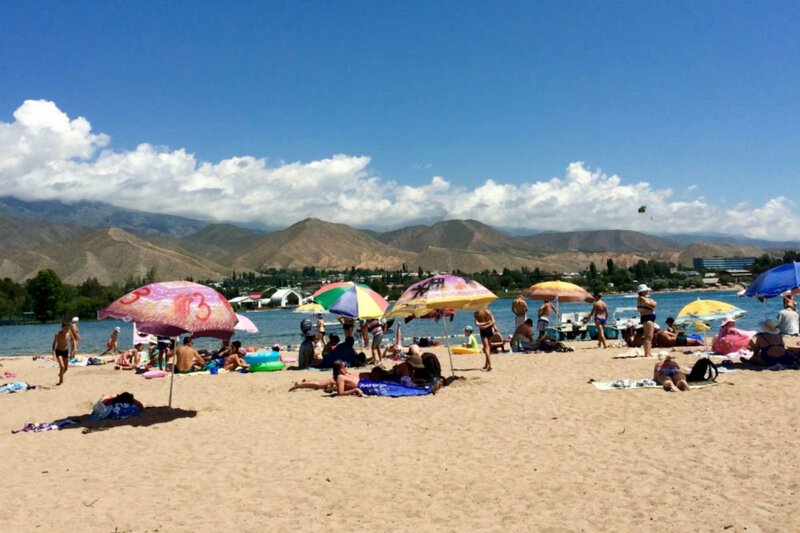 On the shores of Lake Issyk Kul in northeastern Kyrgyzstan. All photos by Tess Chapin. 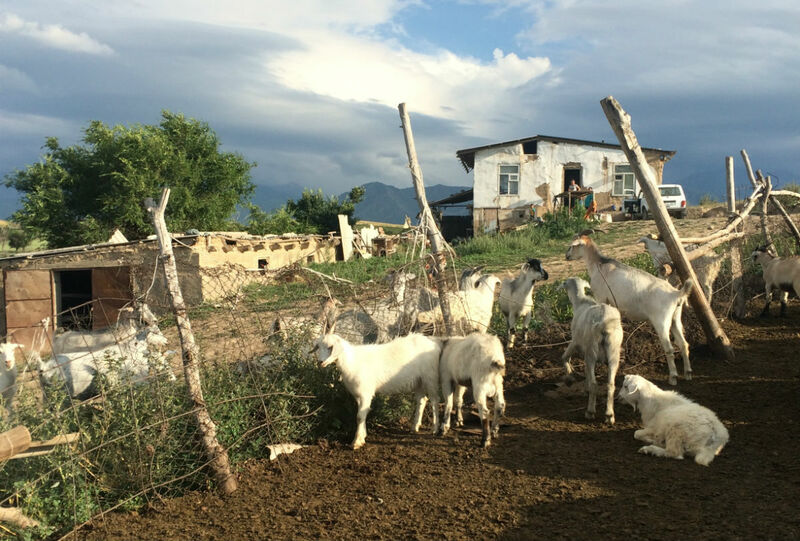 A self-professed Central Asia nerd heads to Kyrgyzstan with a one-way ticket and no plans. Her secret weapon? Tinder. BISHKEK, Kyrgyzstan – It's been 24 hours since I arrived alone in Bishkek, Kyrgyzstan, with no plans aside from two nights booked at a youth hostel. Now I find myself with a group of English-speaking 20-somethings and a Kyrgyz family, in a yard on the side of a mountain on the outskirts of the city. After the obligatory what-are-these-weird-Americans-doing-here photo shoot, the round-bellied Kyrgyz father has gone to the livestock pen 20 yards from the front door, grabbed a sheep by the neck and dragged it over to a shed. I know what is coming next, and I brace myself to witness the live slaughter of an animal for the first time. It may seem surprising to some that I have managed to go 22 years without witnessing this ritual of human consumption, but I am a vegetarian hailing from the concrete expanse of New York City. I don't do livestock. I hear the unmistakable sounds of this poor animal meeting its fate as I try to distract myself by petting the remaining animals. Once the deed is done, the smiling man invites my companions and me to stay for dinner. BBQ is on the menu. The home of the hospitable Kyrgyz family that invited the author and her friends for dinner. 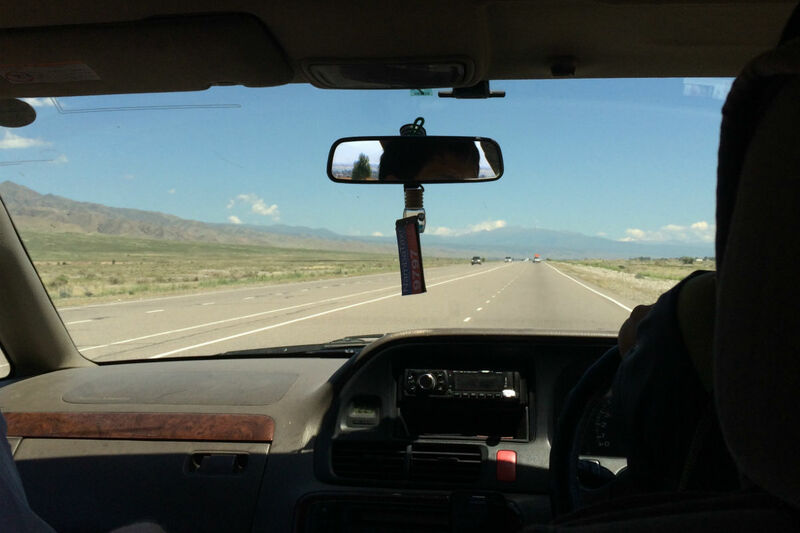 Twenty-four hours after the sheep incident, I am in a minivan speeding along the Kyrgyzstan side of the Kazakhstan/Kyrgyzstan border in the midst of a three-hour ride to visit Lake Issyk Kul, the world's second largest alpine lake. A vast landscape of canyons and mountains alongside the Chu River is unfolding on either side of me, strikingly beautiful and unlike anything I have ever seen. Our cab driver, a young Kyrgyz man from Bishkek, looks no older than 25. Cigarette dangling out the corner of his mouth, he reaches for the CD player in the front console, pushes a button, and “X Gon' Give It To Ya" fills the vehicle. I look around at the other people in the car, a group of Americans I met 18 hours ago, with a look of disbelief. The driver looks back at us and winks. Did that really just happen? I came to Bishkek at the conclusion of a two-month Russian language intensive program I attended at Nazarbayev University in Astana, the capital of Kazakhstan. I was incredibly nervous for this leg of my adventure, not because the area itself made me uncomfortable, but because I knew no one, had no plans, and really didn't know how this one was going to pan out. I had a one-way ticket to Bishkek from Astana, and I didn't know how and when I would be returning to Kazakhstan. My only logistical constraint was my flight back to NYC in a week's time. I was winging it in a major way, something that often does not bode well with my type-A, semi-neurotic, Jewish-New-Yorker self. A Soviet-era minivan and a DMX CD made for one of the weirdest and best road trips. When I arrived at the hostel on my first day, after a long cab ride where I was interrogated about my lack of husband and children by a well-intentioned old Kyrgyz man, I saw at least dozen pairs of hiking shoes by the door. This was no surprise, as Kyrgyzstan is world-renowned for its hiking and trekking. Hiking was not high on my list of priorities. In fact, I have never owned a pair of hiking boots. The hostel was full of hard-core travelers, the type of people I aspire to be but feel a little uncomfortable around. Did these cool people roll their eyes when they overheard me asking the front desk for help making a reservation for a massage at a spa a few blocks away? Are they judging me because I brought Spanx and large gold hoops to Central Asia? It was clear I had a slightly different agenda from the usual trekking types. I needed a new situation to find friends. So I did what I do best: whipped out my phone, pulled up Tinder, and began swiping away. My plan worked fantastically. Tinder allowed me to connect with those around me, both American and local, which opened up many valuable social connections at a time when I was feeling alarmingly alone. Those people introduced me to their friends, who welcomed me — this strange girl who mysteriously appeared alone in Bishkek — with open arms. The conditions of our meeting, in this strange and foreign place, made for instant bonding. Tinder connected me to new friends who became travel companions, tour guides, translators, collaborators, and individuals who singlehandedly transformed my time in Kyrgyzstan into one of the best experiences of my life. Tess is an intern at Fathom and a Central Asia nerd. She travels for the discovery.